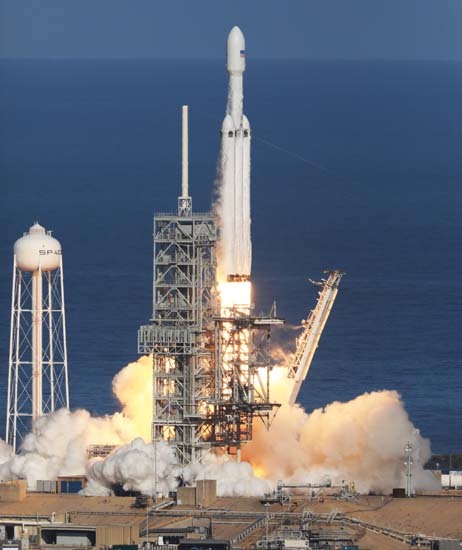 SpaceX has rescheduled the second launch of its Falcon Heavy rocket from NASA’s Kennedy Space Center in Florida for Wednesday, April 10. The nearly two-hour window opens at 6:36 p.m. EDT (2236 GMT). The booster will launch the Arabsat 6A communications satellite, which will provide Ku-band and Ka-band communications services for the Middle East, North Africa a part of South Africa. This will be the first Falcon Heavy rocket to use the more powerful Block 5 boosters. The two first-stage side boosters will land back at Cape Canaveral while the center core will land on an off-shore drone ship. Not a surprise SpaceX push back the launch by a day. The weather was looking to be about 20% go for Tuesday compare to about 80% go for Wednesday. Should be more folks watching the launch near KSC with better weather outlook. It is going be a spectacular inaugural night launch for the Falcon Heavy. We will see the “Eyes of Sauron” when the side cores comes back to landed at LZ-1 & LZ-2. It is going be a spectacular inaugural night launch for the Falcon Heavy. Is the Falcon Heavy performance data listed at spacex.com, based upon block 5 stages? I would assume it is, since Wednesday’s launch using block 5 is the first paying customer instead of a test launch. But you never know! It is a 2 hour launch window. Think the exhaust plumes will be more visible if there is still sunlight. Which puts the end of the launch window right at the beginning of nautical twilight, which is not really what, as an astronomer, I’d call “night”. I believe you are correct, but I cannot recall my source for that. F9’s capability on the site was for later versions for years before those versions actually flew.